Your shiny new Canon camera is your best shooting buddy. You take it everywhere, shoot beautiful photos, and upload them in various places. It works well enough with the right glass, right? You can do more with it with the right Android app. Some can control your camera for your and make shots easier to get. There aren’t a lot of options out there. However, some of them do pretty good. For the most part, we recommend people use cables, Wi-Fi connections when available, and SD cards to transfer data and view your camera content on anther screen. 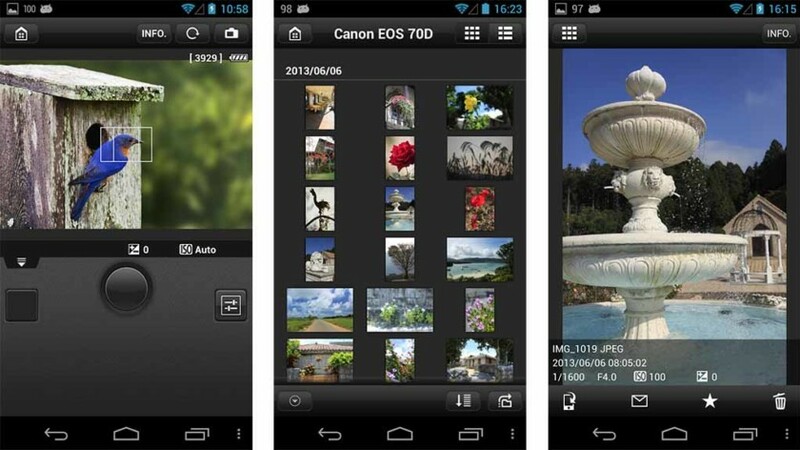 Here are the best Canon apps for Android. Here are some more camera apps you might find useful! Camera Connect and Control is one of the better Canon apps. It also works with other camera brands. It also has support for some Sony, Nikon, and GoPro cameras. However, its wheelhouse is Canon. Most of the features come for free. That includes connection over WiFi or USB, download files from the camera, and more. There are two different pro versions. The cheaper one removes ads and lets you see EXIF data. The full pro version lets you use your phone as a live camera view and burst mode. Canon Camera Connect is one of two official Canon apps. We don’t recommend trying the older one. This is the official one now. You can connect to the app from the camera. It lets you download and save images from your camera to your phone. You can also remote shoot from the app, and more. It supports many different Canon cameras. The app could use some work. Other people have complained about the design and moving around the app. It should be one that you at least try, though. It’s free with no in-app purchases. DSLR controller is specifically for Canon EOS cameras. It is by the famed Chainfire. He’s an all-star in the developer space. The app is essentially what you think it is. It controls your camera. You can use your phone screen as the viewfinder. You can also snap pictures, change various settings, zoom, and other stuff. It’s a bit finicky to work with. Chainfire recommends checking the full website for information on what the app can do and how to use it. It’s one of the better Canon apps for sure. Helicon Remote is the most expensive of the Canon apps on the list. It can do the basics that most tethering apps can. You can shoot photos, change a few settings, and live view. It can also take burst shots with different exposures for HDR style imagery. You can even use it for video recording. The basic, single-device license runs for $48. There is also an option for unlimited devices for $75. That’s rather expensive. We wouldn’t blame you for not wanting to pay that. However, the free version has a few of those features. Canon has a variety of other apps on mobile. That includes software for their printers, business apps, a disc label maker app, and even another Canon camer app (EOS Remote). Anyone with a Canon product should probably give these a glance. In most cases, Canon makes somewhat decent apps for their products. Plus, they’re all free with no in-app purchases. That means it won’t cost you anything to try them. That’s usually a good thing. If we missed any good Canon apps, tell us about them in the comments! You can also click here to check out our latest Android app and game lists!